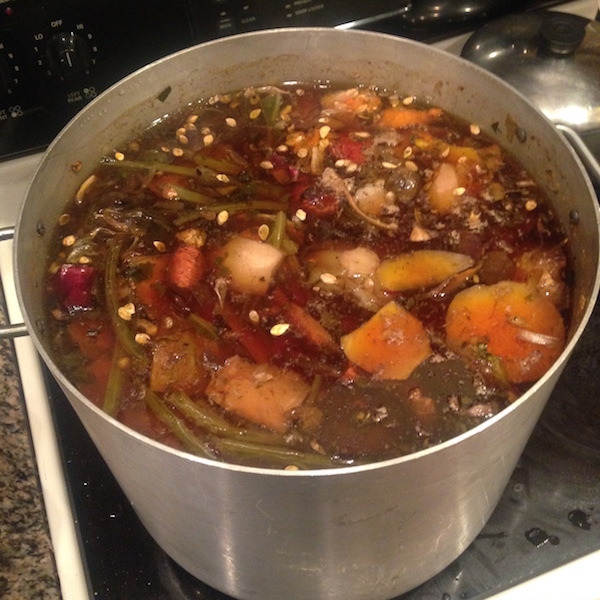 Have you ever wondered how to make vegetable stock? It turns out that you can use just about all of your veggie trimmings from the CSA for stock making. Here’s a little step-by-step guide for getting the most out of your CSA shares. Soon you’ll be enjoying extra nutrients in your rice and delicious soups. Check it out! Begin saving all of your veggie trimmings including onion skins, garlic husks, carrot ends, outer leaves of cabbages, and other veggie scraps from your cutting board. You can use just about any trimmings: tomato ends, winter squash peels & innards, beet greens, kale stems, etc. 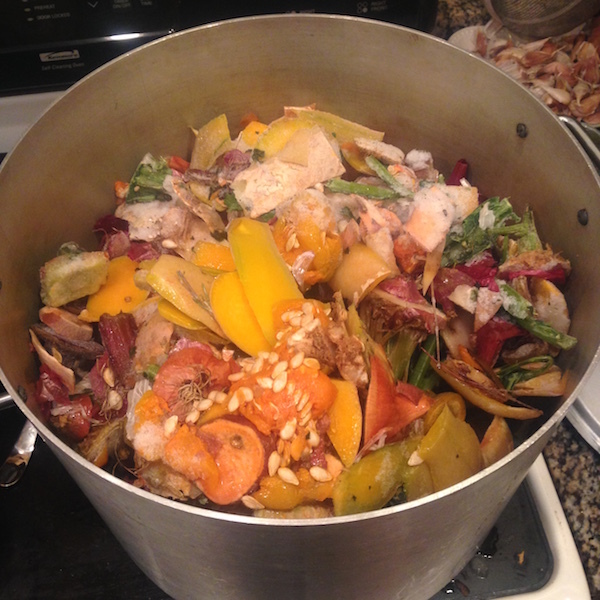 Basically, anything you would compost, you can use for stock. Place these in bags and put them in your freezer. You won’t fill a bag all at once. It will be a gradual process, so make sure that it’s easy to re-open the bags. 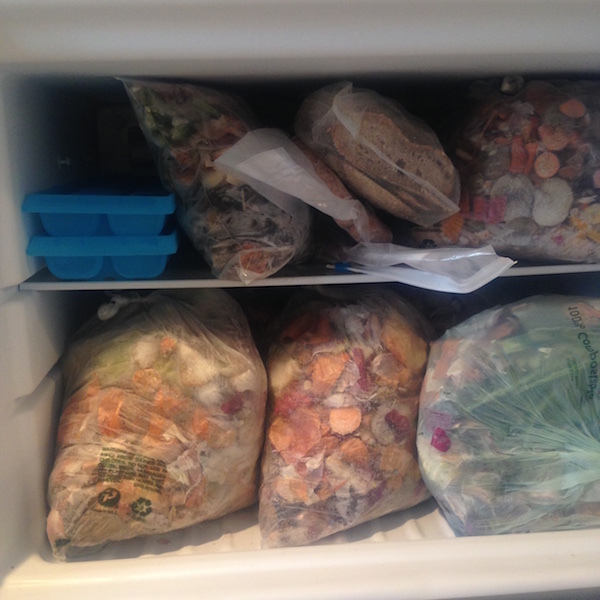 You’ll notice that Amanda & I have stuffed our freezer full of veggie scraps. We’re really due for another stock-making night! 2. 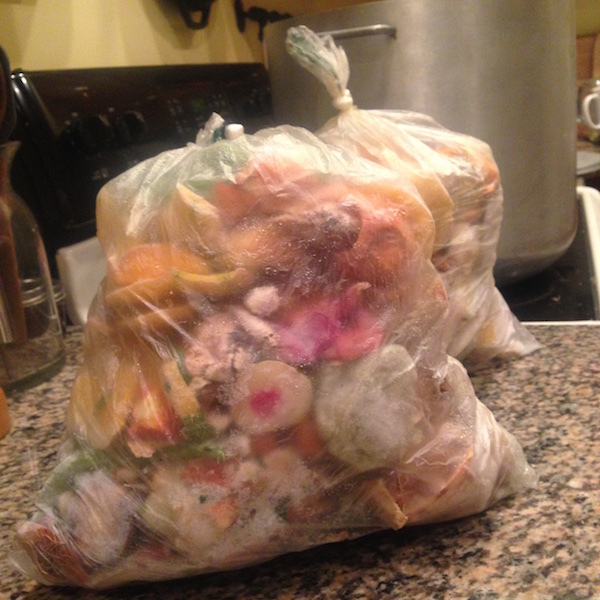 Once you’ve collected 3 or more bags of frozen veggie trimmings, remove them from the freezer. Toss the trimmings into a large stock pot. Add water until the pot is almost full. If you want to make a meat stock, you can also add a beef or pork soup bone, or a chicken or turkey carcass. Turn the burner on high and bring the pot of trimmings and water to boil. Reduce heat and simmer for at least 2 hours with the lid on. 3. Once the stock has simmered for 2 hours. Turn off heat. Let sit for an hour with the lid off. Then carefully place in the fridge overnight. 4. 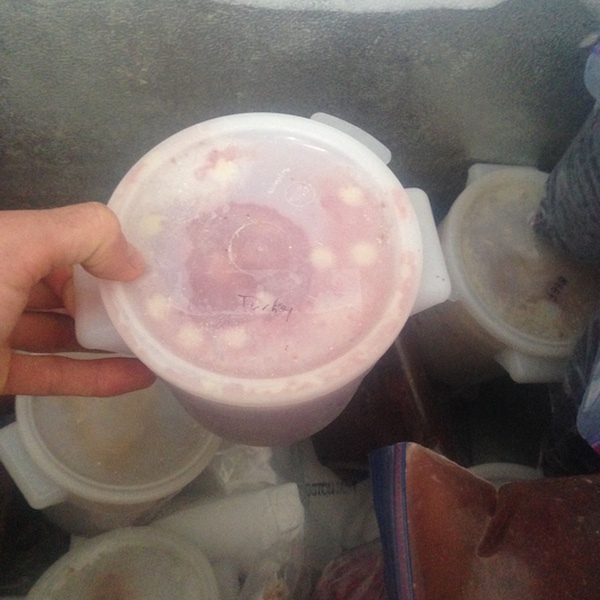 In the morning, you can strain the stock into freezer containers. 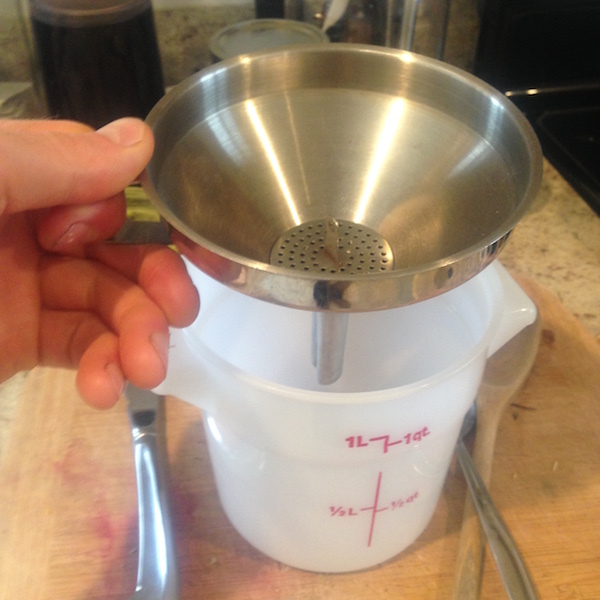 We have this nifty strainer. You can use 1 quart freezer bags too. Label your containers: “vegetable”, “turkey”, “chicken”, etc. Place the filled containers in the freezer. 5. Whenever you want to make a soup or use stock as the liquid for making rice, retrieve a frozen container of stock from your freezer. Enjoy!